Back in 2006 'Bare Boards and Blue Stilettos' was an uncomfortable installation immersing the audience in faulty communication and uncertain access. I began working on it in 2005, it was my first major piece of Disability Art. 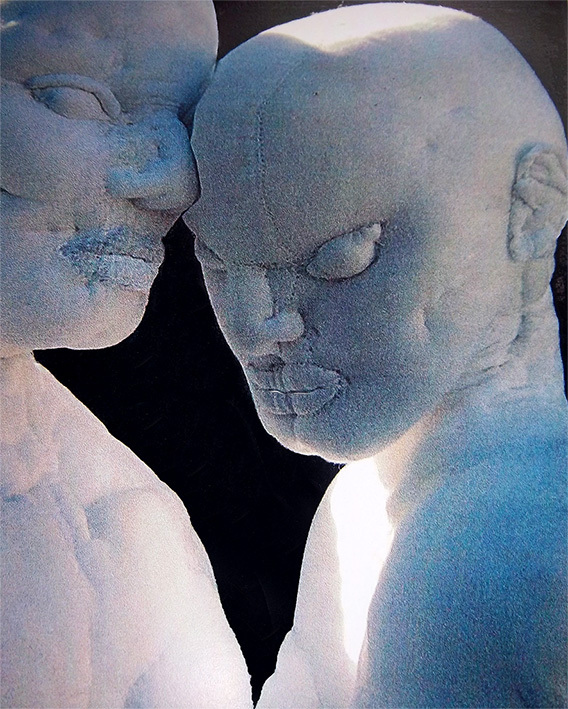 Jessie seeks to be 'People Like You' - she was my first soft sculpture, born out of despair (unlike Kouros and Koure), reaching down into the depths to make her connections. When '(it might be disability, but) it's Still Life' was exhibited at Holton Lee in 2011, Jessie was intended to join Kouros and Koure, lying in the ground beyond them, her searching roots just beginning to show. I began working on the roots, but somehow it never came together. I had moved far from Jessie's dark despair and I kept wondering if it was all too personal. Would Jessie speak to anyone else? I tried to put her back in storage, but as soon as 'People Like You' began taking shape, Jessie put herself back on the agenda. Jessie began in the conflict between my personal, private identity and the face I wore in public. Jessie, unable to stand, sought an identity through symbolic roots, roots burrowing into some other state of presence. Stitching, I am drawn to link the roots I'm now creating with mobile phones (rooted androids, superusers) and social networking. Reaching into our own darkness, roots become symbolic of the search for connectedness and symbols of that never-in-the-present state most people seem to be practicing. Between posting, pinning, texting and tweeting, my thought for the day is that social networking could be the Borg and we are all being assimilated, willingly. Eagerly assuming that we are each expressing our unique individuality, are we in fact creating one monstrous identity where each one of us is just one more line of code? Or is it something else? me down, calling me in. in my life, my destiny.